Spazio Europa, the European Public Space (EPS) in Rome, is managed jointly by the European Parliament Information Office in Italy and the European Commission Representation in Italy at IV Novembre st. 149, Rome. Methodologies, contents, and learnings to implement the social-pedagogic competences in the national training systems. Relevant aspects of the tests carried out (of the training module). Attachments: Poster, slides of the speakers, Last Move publication, photos. The 29th September at 9.30 at Spazio Europa, managed by Information Office in Italy of European Parliament and European Commission’s Representation in Italy, at Via IV Novembre 149 in Rome, will take place the final event of the MOVE project Movement Valorize Europe: New Competence for Trainer and the submission of final outputs of the project: Learning Units for competences and the guidelines for trainers. Move is co-financed project by European Union in Erasmus+ strategic partnerships, implemented by “Centro Sportivo Educativo Nazionale” (CSEN), University of Roma Tre – Higher Education department, People srl Projects and induction for the Empowerment, National Sports Academy in Bulgaria, University of Sports Science in Poland, Sports Association Promitheas in Greece. The “MOVE CLU MODEL” aims at presenting the general guidelines orienting the training model in the ProjectMOVE –“MOvement Valorize Europe project context. New Competence for trainers”. It intends to contribute to the reaching of the project results, with special reference to the second intellectual output: O2 TRAINING MATERIALS, in the different countries. The Competency-based Learning Unit is a methodological guide conceived to make training and updating easier for different systems and companies’ staff in the engagement of people who practice sport. In fact, sport - in particular, non-professional sport for all - puts into motion energies, time, professional competences as well as transversal and strategic competences, which often go beyond the "simple" educational level, beyond the capacity of improving the physical form or the sports techniques. Dissemination and exploitation of the Project Move activities at the University Foro Italico in Roma, where the next sports technician and directors will be trained. The organization and the advertising of the event it has the purpose to inform on the researches carried out on 900 people sport technicians and sports directors in the four Countries partners of the project. To update the work that we are doing and to underline what new transversal competences are requested to the professionals of the grassroots sport area, to answer both to the new social needs and to the role that is given to the sport by the Europe in the planning 2014 -2020. 3° Multiplier Event, Patrasso, Greece. It’s the occasion to raise awareness of the project in capillary way to the territory and the interested stakeholders. Presentation of the two researches carried out, presentation of the tests of the elaborate training module. Report from National Research on the Project whit 600 questionnaires will be collected: approximately 300 will be submitted to people who play sport and 300 to people who do not play sport. To identify and involve the second target group, the partners will liaise with the reference local network (social services, volunteering organizations, schools, families, single citizens). 29 – 30 March in Sofia took place the 3° Project Meeting of MOVE Project. The two days of work have had as objective to confront in plenary on the Report of data analysis of the national researches of the Countries partners on what needs and motivations that making people to play sport with regularity or people who don’t play sport. The second focus of the meeting has been the confrontation on the draft elaborated by the University Rome 3 related to the elaboration of the training model and how to organize the tests of the module in the different national contexts. The European project “Move” has entered the second phase. The transnational survey aiming at identifying the social demand for sport was embarked on a few days ago, the target people are the young (18-29 years) and the elderly (over 55). 600 questionnaires will be submitted in the Partner countries - Italy, Poland, Greece and Bulgaria - for the purpose of this research, which involves sportspeople and people who do not do sport activity. The questionnaire is designed with the aim to collect data concerning what needs encourage people to practise or prevent them from practicing sport activity on a regular basis. The questionnaire is to be finalized during the 2nd transnational meeting and will be submitted to 600 people – athletes and non-athletes, the two main categories of project beneficiaries, the young and the elderly. Out of 600 questionnaires, 200 will be the result of the research conducted in Italy, 200 of the research conducted in Poland, 100 in Bulgaria and 100 in Greece. The sample used by the research will be those who practise and those who do not practise sport, and the questionnaire can either be filled in on line through the Move platform, or directly submitted. Like in the previous Research, a guide will be elaborated, so as to allow all partners to collect data in a homogeneous manner for the purpose of study and data analysis. The analysis of the collected data will be used to elaborate the first draft training unit for sport managers and operators, the key goal of the project. On 28 and 29 September 2016 in Gdansk, Poland, the 2nd transnational meeting of the Move project partners is held. The two-day meeting focuses on finalising the definition of the research to be carried out during the following months, October, November and December 2016. The survey, on which all partners’ commitment will be dedicated with remarks and in-depth analysis during the two-day meeting, is the 2nd output foreseen by the project: It intends to analyse the motivations that lead people to practice sport and the motivations behind the choice of practising no sport at all. In brief, the intention is to examine what needs motivate and demotivate people to practice sport activities. Like in the previous research, a guide will be elaborated to allow all partners to collect data in a homogeneous way for the purpose of study and data analysis. This communication reflects the views only of the author, and the Commission cannot be held responsible for any use, which may be made of the information contained therein. On 24 June 2016 at "NSA VassilLevski" Studentski grad”, Sofia, the second multiplier event of the project was held. An event of dissemination and diffusion to give more visibility to the project, particularly relevant for Bulgaria who is called to elaborate the Comparative Report, the result of the analysis and study of the data emerged from national research, carried out in each partner country. The paper is the first output of the project: Competences For Activation. On 10.06.2016 at AkademickiZwiazekSportowy, Warsaw the first multiplier event of the project took place, in which Local Administrators, Sport Managers and Sport Coaches were invited to take part. During the event, the project was outlined and discussed with the aim to receive useful feedback on sport managers and technicians’ training needs, as well as on the political strategies implemented and to be implemented in the near future, so as to contribute to enhancing sport in social processes of inclusion and participation of all people. The MOVE project intends to take up the challenge launched by European policies with the new 2014-2020 programming period, and to re-launch the sport sector together with its fundamental values of inclusion, aggregation and education. The project is firmly convinced that sport implies a strong educational and social value, above all in its declination of grassroots sport. So, it points at “coaches”. Indeed, MOVE intends to elaborate a “Training Unit” to be incorporated in the training path directed to Sport Executives and Technicians for the acquisition of socio-educational competences, a transferrable and recognizable training model, as envisaged by the European Qualifications Framework (EQF) and the European Credits in Vocational Education and Training (ECVET). The main objective of MOVE is that of designing, through a process of research and analysis, Competence Learning Units in order to strengthen strategic and cross-sectional competence dimensions (such as relational, multicultural, that of empowerment and resilience, etc.) of the different professional figures (coaches, teachers, trainers, sports managers, operators, etc.) regardless of their specific sport discipline. 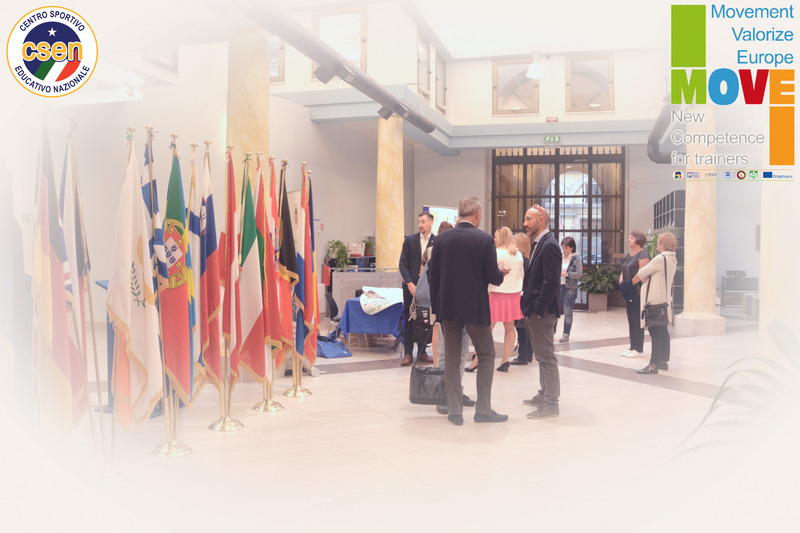 For this reason, MOVE has built a partnership (Italy, Bulgaria, Greece and Poland) between national sports associations, universities and VET providers, thus including various approaches and experiences. to contribute to the acknowledgment of titles and qualifications in Europe; and to increase trust between the different systems.